Elliott Chamberlin is a passionate, dedicated, and fun music teacher. He earned his B.A. in Music Composition from the University of Maryland Baltimore County and is a classically trained pianist with over twenty years of playing experience. 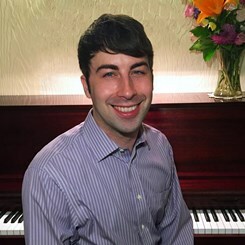 Teaching since 2014, Elliott works with both kids and adults, and aims to inspire each student by making his or her musical journey fun, creative, and challenging. Request Lessons with Elliott today!